World famous for its natural beauty, iconic history and incredible events, the Monterey Peninsula has amazed visitors for decades. More recently, however, wedding fever has caught on in this area and not just by the residents. As destination weddings have become as much of an option as more traditional ceremonies, couples are continually looking for something different. Places such as Hawaii and Las Vegas will always be popular, as will other tropical locations, but where else can two lovebirds and their families find such a wide variety of locations for their perfect day? Whether big or small, simple or ornate, the Monterey Peninsula offers a venue for every type of wedding. If you are looking for a natural setting many of the local, regional and state parks offer locations that are beautiful and practical at the same time. Lovers Point Park in Pacific Grove is continually voted as best wedding venue by local publications. It offers a grassy park overlooking the Monterey Bay and who can beat a place with Lovers in the name. But, if a true beach wedding is your desire, the Carmel State Beach or Asilomar State Beach are great choices that are serviced my many of the local event companies. Meadow and forested themes are also gaining in popularity. Facebook founder Sean Parker went all out in Big Sur and there are several great locations at Pfeiffer State Park, as well as the Santa Lucia Chapel owned by All Saints Church. The outdoor chapel which is nestled in a grove of redwoods overlooks the Big Sur River offers a truly rustic experience. Breathtaking views are the hallmark of the Wedding Rock in Carmel, which sits high upon a bluff overlooking Monastery Beach. Simple yet unique, this site is managed by the California State Parks system. 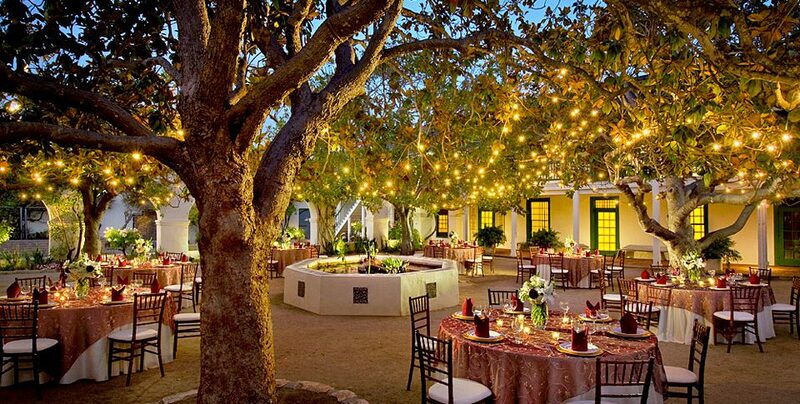 One of the most popular wedding themes over the past decade is the Rustic or Shabby Chic event. While these weddings can be held at a traditional hotel or event space, their reliance on the thematic location has allowed many local historical landmarks to become something more, housing many couple’s special day. Chautauqua Hall in Pacific Grove, built in the late 1800’s, was once a place for religious events and artistic gatherings. Now, it sports a modern kitchen and a flowered garden outside. If, however, you seek the best of everything, look no further than the Memory Garden located next to the Historic Custom House Plaza in Monterey (just steps from the Portola Hotel & Spa). The adobe walled garden offers a fountain amid Southern Magnolia trees and a lush flower garden. This California State Park venue, is attached to the garden is the Historic Custom House which offers 19th century Spanish Maritime architecture and authentic Monterey Bay charm. Continue the celebration converting the ceremony space into your reception or change it up a bit and head on over the Portola (just steps from the garden), dance the night away in one of their ballrooms or outdoor courtyard and let their amazing event staff take care of all the details. From the beauty of the Monterey Bay and the history of Old California to the serenity of the coastal California Redwood forests, the Monterey Peninsula offers so much for regular visitors, but it offers the ultimate in destination wedding experiences.